A fully professional dishwasher with a comprehensive specification designed to deliver sparkling clean results every time. The electronic soft touch control panel offers a host of additional features and a digital read out of operating temperatures. 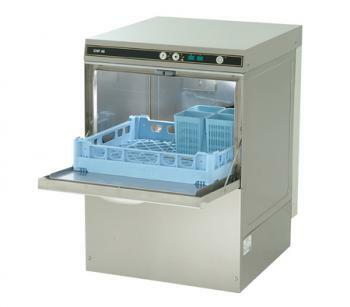 Complete with: a choice of four wash cycles 60, 120, 180 seconds and a continuous option, items up to 280mm tall easily accommodated, detergent rinse aid dosing and drain pump included, energy saving stand-by feature and supplied with a plate rack, cup rack and cutlery basket. Class A Airgap, booster pump along with detergent and rinse aid dosing equipment. Thermostop rinse control which ensures that the machine will only rinse at the correct temperature. More products in Frontloading Dishwashers.